The International Committee of the Red Cross (ICRC), working alongside the Syrian Arab Red Crescent (SARC) and the United Nations (UN), has begun delivering vital aid to thousands of people living in three besieged areas in Syria. Food, medical items, blankets and other materials are being delivered by convoy to the towns of Madaya in Rural Damascus, and Foua and Kefraya near the city of Idleb. There has been growing international concern about the suffering of thousands of people in these areas. The ICRC will concentrate on delivering medical assistance. Map of Syria showing the ICRC's presence and the location of the three besieged towns of Madaya, Foua and Kefraya. "The operation has started. It is likely to last a few days. This is a very positive development. But it must not be just a one-off distribution. To relieve the suffering of these tens of thousands of people, there has to be regular access to these areas," said the head of the ICRC delegation in Syria, Marianne Gasser. There are believed to be around 40,000 people in Madaya and around 20,000 people in Foua and Kefraya. The operation has been brokered by the UN with the agreement of the different parties on the ground. "We have to remember that there are more than 400,000 people living in besieged areas across Syria. The suffering is intense. Aid agencies must be given safe and unimpeded access to all these people to provide them with the aid they need, especially now in the midst of winter," said Ms Gasser. 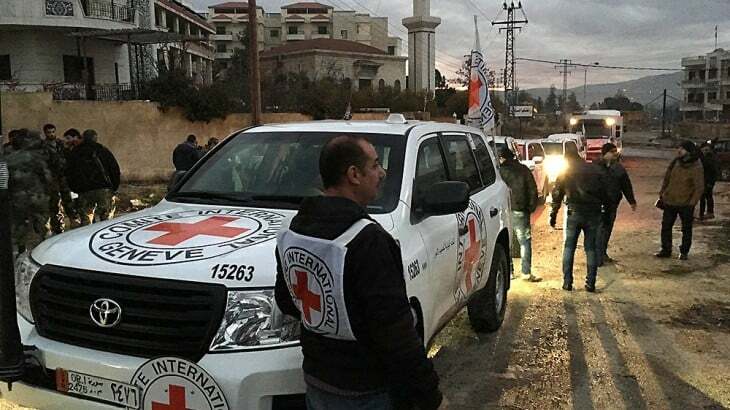 Listen to an audio statement direct from Madaya by ICRC spokesperson Pawel Krzysiek. Photos/images from Madaya are also available on www.icrcvideonewsroom.org.